Ready for a Cancún Vacation? AND, Enjoy Personlized Service from a Cancún Vacation Expert at no added cost! Cancún is a colorful and vibrant city that satisfies every craving a traveler could have. It's a place where Mayan cultural influences meet stunning beaches and thrilling nightlife. A typical stay in Cancún consists of trying new foods like Mole and churros, sunbathing in Playa Norte or ziplining the jungle by day and dancing the night away. Recharge, get inspired, and enjoy one of Mexico's best gems. Whether you're an adrenaline junkie, or a beginner, Cancún offers exhilarating experiences for everyone. 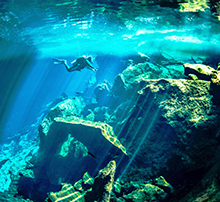 Visit any of the water parks or eco-parks for underwater river swimming or if you're feeling more adventurous swim with the friendly whale sharks or plunge into a cenote. Which will you do first? Xcaret Park and the unique cenotes like Dos Ojos! 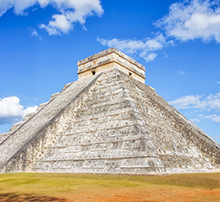 Discover the heart of Mayan culture, Chichen Itza and Tulum. 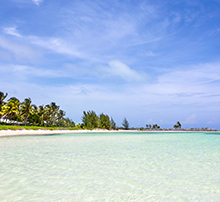 After an exciting tour, cool off at the surrounding underwater caves and beaches. For another adventure, soak in the sun and savor fresh seafood at Isla Mujeres–a cannot miss hotspot. availability for transportation and excursions! Each beach in Cancún is unique and offers a different vibe for each kind of traveler. What do they all have in common? Clear blue water that will heal your soul and make you feel like you're in a dream, especially with tropical weather that stays in the 80's year-round. Playa Tortuga, Playa Delfines, and Playa Carcol! Join the party at the hottest club scenes all within walking distance of each other and open until dawn. Some clubs even have open bars. 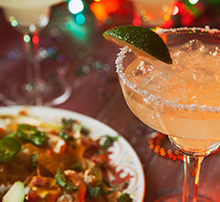 After a fun night out, choose from diverse dining options including gourmet international cuisine, fresh seafood like ceviche or late-night Tacos al Pastor. the top clubs and restaurants in Cancún!